It seems that spring is finally here, so now is the time to review your beauty routine and products that you use, switching to lighter ( but not less effective ) formulas and brighter, prettier colours. As the sun is starting to make regular appearance don’t forget to introduce a sun protection product ( it’s better to have a separate product but if you use a face cream that already contains an SPF it’s much better than not using anything at all ) and start making small changes to your fitness routine, as summer follows spring and sandy beaches will beckon you. Today I will start with a perfect product for the delicate eye area ( one of the first places on our face to show lack of sleep, ageing & poor hydration levels ), as well as spring eye-shadows. 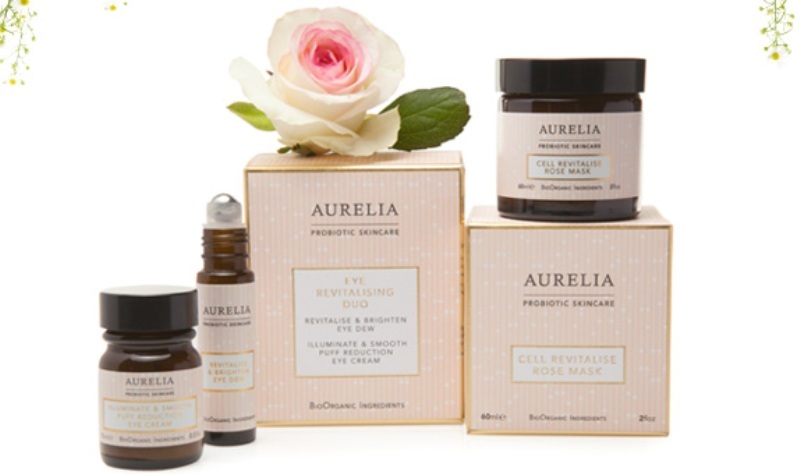 Aurelia Probiotic Skincare Revitalise & Brighten Eye Dew ( 10 ml ): I love this brand not only for the beautifully smelling products ( each product has its unique smell and trust me, not many beauty brands do that within their line of products ) but for their efficacy, femininity and wonderful customer service. At the end of last year Aurelia added Eye Revitalising Duo, which consists of ‘Revitalise & Brighten Eye Dew’ to use in the morning and ‘Illuminate & Smooth Puff Reduction Eye Cream’ for night-time. The cooling sensation of the rollerball applicator will wake up your eye area in the morning and targets wrinkle reduction. Its gentle lymphatic massage ensures that the blend of actives and botanicals will get more effectively absorbed into the delicate skin around your eyes. Within a few days of using it, I noticed that dark circles that I tend to get due to late nights, seem to be less apparent and the under-eye area in particular looks brighter. The eye dew contains Aurelia’s signature probiotic, peptide and repair technologies that will help to reduce inflammation within skin layers. This eye formula also contains Jujube and Olive extracts that promise to deliver age correction and tighten the delicate skin. All you need to do is to shake the rollerball to activate the formula and glide it lightly all over your cleansed eye area, then patting it gently in with your ring finger. Its smell is a little reminiscent of Aurelia’s face oil and as every of their products, smelling it in the morning puts a wide, energetic smile on my face. Truth be told I find the rollerball applicator a little annoying sometimes, as I need to shake it more vigorously for the dew to come out and also make sure you glide it softly, so it doesn’t ping the skin. The cooling sensation feels lovely in the morning though and you can use the actual rollerball in the evening as well ( just don’t shake the dew out on this occasion ), once you have applied the night cream. Another added bonus is that the eye dew makes a perfect canvas for concealer or corrector and helps the product to last longer, without you getting annoying little concealer creases later in the day. It is also beautifully moisturising, even when you forget to drink enough water during the day. Aurelia Probiotic Skincare Illuminate & Smooth Puff Reduction Eye Cream ( 15 mls ): it has a rich texture, so worked beautifully in winter, but as it sinks in very quickly it will work as well in springtime. The glass pot comes with a little applicator but I prefer to dip my finger in ( make sure you wash and dry your hands thoroughly if you prefer to do it in the same way, so there is less chance of introducing unwanted bacteria in your product thus changing its efficacy ) and pat the cream gently around my orbital eye area. The cream is packed with supercharged levels of Aurelia’s signature probiotics and is infused with healing arnica and centella asiatica, as well as butcher’s broom ( effective in increasing the circulation ) that work on reducing inflammation within your skin, puffiness and dark circles. It also increases the luminosity in the eye area, making the whole eye area look refreshed. Even though the Eye Duo isn’t cheap, the products compliment each other in their multiple effect; Morning dew is lighter in texture and the cream is richer and more nurturing for the skin at night-time, when the process of rejuvenation and tissue regeneration take place. It shows that Aurelia team has an all-angle view when they develop their products. It takes the thought out for you and targets all the problems that women have, whether you are working and partying in your 20s or greeting motherhood in your 30s and 40s, while combining it with work or multi-tasking chores and childcare. Rouge Bunny Rouge Eye Shadow ‘When Birds Are Singing’ ( £24 ): those long-lasting Eye Shadows from RBR tend to get a lot of praise from beauty bloggers, as well as Rouge Bunny Rouge customers ( yours truly included ) because you can’t help but like their textures and colour, as poetic as their descriptions. This spring Rouge Bunny Rouge extended their eye shadow color choices with two new additions, ‘Rain Dove’ and ‘Rufous-tailed Weaver’. It is sometimes difficult to describe RBR products in the same delightfully creative way as their team does, so I am going to quote them here: ‘‘Rain Dove’ is the lightest taupe with rosy highlights and gives an overall satin finish, while ‘Rufous-tailed Weaver’ is a medium taupe with bronzy-gold highlights”. The beautiful thing about those two shades is that you can wear them on their own, either wearing it applied around the eyelid or taking it up to the brow bone or you can mix them for a subtle contrasting look. Personally I like to wear ‘Rain Dove’ during the day for a classically seamless, almost bare yet perfectly polished look and add ‘Rufus-tailed Weaver’ in the evening, for a slightly more glamorous look or when I look a little tired in the morning, as this is an eye-shadow that will brighten and illuminate the eye area, when applied after Aurelia rollerball dew. According to Rouge Bunny Rouge make-up team ‘Rain Dove’ is ”a perfectly matched shade for light skin tones or can be used as highlighter for darker skin tones”. The best way to approach your make-up is to experiment and see what combination warms up your complexion and enhances your features. Rouge Bunny Rouge eye shadows stay put quite well on their own but if you want to make sure your make-up looks perfect throughout the day, then follow Rouge Bunny Rouge make-up artist’s advice: ”If you would like to achieve a very long-lasting result we recommend using our Aqua Primer as a base for your eyelids. You can use either your fingertips or a brush. Blending is much easier with a brush, but either way is fine for a lasting result.” As an alternative I also like Becca’s Eye Priming Perfector. Ingredients: Talc, Mica, Dimethicone, Octyldocyl stearoyl stearate, Nylon-12, Zinc Stearate, C26-28 Alkyl Dimethicone, Zeolite, Sorbic Acid, Methylparaben, Aluminium Starch Octenylsucc, Tenylsuccinate, Zea Mays Starch, Propylparaben, Tetrasodium EDTA, Butylparaben, Peg-6 Isostearate, Isononyl Isononanoate, Silica, BHT, PCA Dimenthicone, Cetearyl Ethylhexanoate, Octyldodecanol, Hesperetin Laurate, Butylene Glycol, Trimethylsiloxysilicate, (+/-): CI 77891, CI 77491, CI 77492, CI 77499, CI 77007, CI 75470, CI 77742, CI 77510, CI 77288, CI 77289, CI 19140, CI 42090. As you can see from the list of ingredients, the eye shadows contain parabens and MI that has been getting lots of press due to its links to skin allergies, so they don’t fall into the ‘natural’ products category. Rouge Bunny Rouge long-lasting eye shadows, 25 shades, £19.91 (price is approximate due to conversion, as you are charged in euros ), free shipping to the UK via Rouge Bunny Rouge webshop.